1 each of the top 35 solid colors PLUS extra cones of the most popular colors. 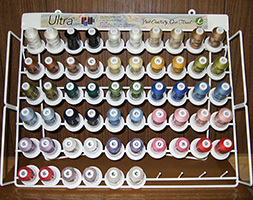 Includes a FREE metal thread display rack! 7/19/2017 – what weight is this? Response From Enmart: This is a 50 weight thread, composed of 3 plies of 47 count (47/3) double-gassed and mercerized Egyptian long-staple cotton for the very best strength and quality for piecing or quilting - with no lint.